Stock trading is one of the most difficult ways to earn money. Traders must keep themselves updated with latest BSE, NSE, Nifty, NASDAQ, S&P 500, DOW trends. Frankly speaking, this is a difficult task for traders as they have to glue their eyes on television or computer monitor all the time. Getting the latest real-time stock market updates can become easier for marketers if they install a mobile/tablet app that fetches latest updates directly from the Stock Exchange. SW is free app with plenty of options. Apart from showing the latest market trends, the watcher app shows financial news, return on Investments (ROI), Money Flow Index of a particular stock. While some apps mentioned on this list sync with Google finance servers, Watcher syncs with Yahoo finance servers. SW has a built-in RSS reader utility with which you can read finance news. It also allows users to see the hottest stock related news on the microblogging site Twitter. The app supports multiple currencies. It supports widgets. SQ is a free stock market app that generates various charts. It provides an option to see the stock price history. It displays trends in any economy and makes sure that you are updated with the stock indexes, funds, etc. Altough SQ is not as popular as the below apps, it has been updated with new features on regular basis. Hence, SQ is one of the best stock market apps. 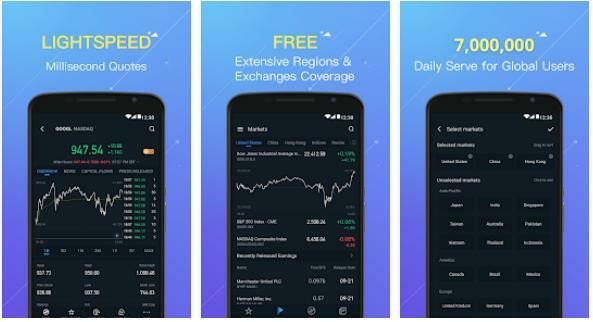 WeBull is a free application which depends on the Google Finance service to show finance trends of US, UK, HK and many other economies. The UI of this Android app is beautiful and easy to use. The application shows portfolio gains and plenty of details for a particular stock. It also lets you create and manage portfolios of stocks. WeBull provides stock market widgets. The app has an option to create alerts. SW is an app that provides real-time information on main Indian stock exchanges, and it keeps you updated with its latest market trends. It includes tools to display intraday charts, equity futures of both Bombay/National stock exchange. It allows you to keep an eye on all the stocks in your portfolio. Data displayed through this app is accurate. The latest version of this app has new and exciting features like widget, expert views for stocks, forex data, etc. It has been optimized to consume very little battery power. The Yahoo stock market app has similar features as Google Finance. It provides pinch to zoom facility, star rating system to bookmark certain stocks, portfolio management, etc. It has better ratings than the above app. Money Contol is a free app that has been designed for the people who want to earn money through stock trading. This app has a nice user interface. It makes you aware of the current status of all the leading stock markets in the world. Its English font can be changed to Gujarati or Hindi on the fly. The app can play live news on top TV channels like CNBC Awaaz, TV 18, etc. It can be installed on phones running on Android Ginger Bread 2.3 OS. Google Finance is one of the best applications on this list of best stock market apps for Android. You have to trust this app because it has been developed and maintained by Google. The application has been downloaded over a million times. It makes you aware of latest stock trends through charts. The Finance app from Google automatically syncs with users finance portfolios, and it displays the most recent stock data in real-time. It also fetches important news on companies. So, what are you waiting for? Install the best stock market apps we’ve shared above and start using them.